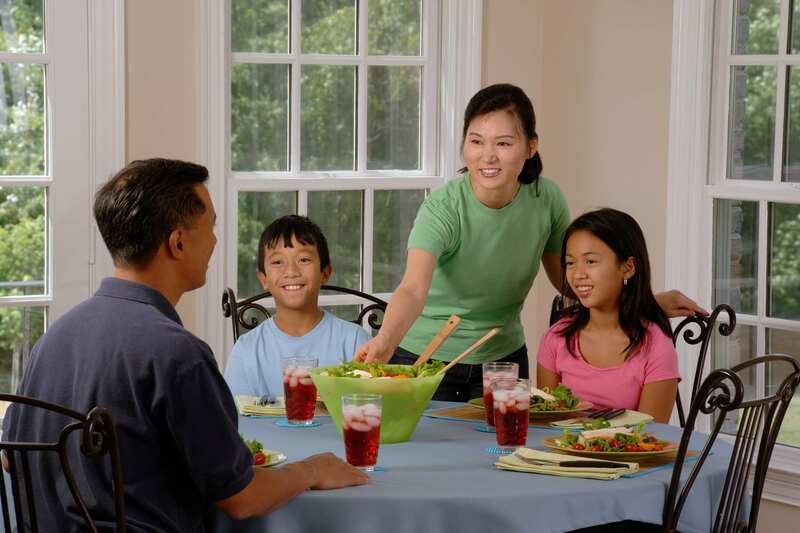 Invest in family-healthy diets by growing half your plate. Plan a garden. Map out a space in your backyard that will make a nice garden plot. Keep it in a sunny spot, away from trees and buildings. Consider installing a fence around the spot, especially if your backyard is frequented by bunnies or deer. If you don’t have a backyard, check out your city’s community garden plots to borrow or rent. Or consider creating a container garden on your deck, balcony or patio. It is easy to grow veggies in any space. Make a list. Write down the vegetables and fruits you want to grow, keeping in mind what plants thrive in your zone, as well as the spacing you have available. If you don’t have space for enough fruits and vegetables to last you the entire summer, consider participating in a co-op or making a visit to your local farmers market once a week to add in a variety of fruit and vegetable options. Start planting. Give your plants all the nutrients they need to grow well, so you can experience a bountiful harvest. If planting in containers, the Miracle-Gro Moisture Control Potting Mix works perfectly for smaller pots or more arid environments, the Miracle-Gro Organic Choice Potting Mix provides an organic potting soil option and the Miracle-Gro Expand N Gro Concentrated Potting Mix is lightweight and expands with water, making it easier to move larger containers while planting. Weeding, pruning and watering. Once planted, fruits and vegetables will likely need a little growing assistance in the form of pulling weeds, pruning back overgrown plants and of course, watering. For best results, water deeply each morning before the heat of the day has taken its toll. Container gardens tend to need to be watered more frequently because growing plants can quickly soak up water added to the container. With good maintenance, your plants should provide you with a large and delicious harvest. Serve up those fruit and veggie dishes. When you’re ready to harvest, start planning menus that will make good use of your garden’s growth. Visit www.groyourown.com to find many delicious recipes that will use different fruits and veggies from your garden. And don’t forget about the USDA’s MyPlate proportion recommendation. When serving, try and keep half of the plate full of what you harvested out of your own backyard to maintain healthy eating habits. If you find yourself with more fresh produce than your family can eat, consider donating to a local food pantry or sharing your harvest with friends and neighbors. '); //var regret_buttons = $('I hit the wrong button!